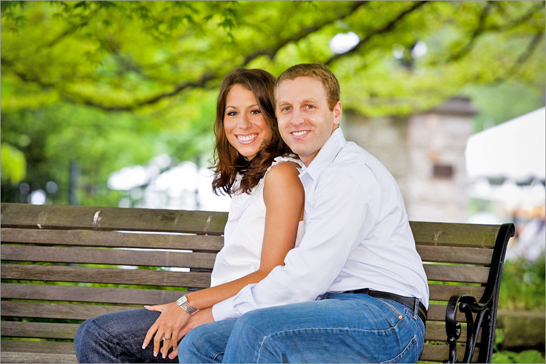 Pittsburgh’s charming downtown area is filled with great locations for your engagement photo shoot. Start off at Point State Park, a Frank Lloyd Wright creation that remains an immensely popular attraction for Pittsburgh locals and tourists, alike. Have your engagement photographer snap some candid photos as you and your fiancée take a leisurely stroll around the recreation area, whose large shade trees and lush green lawn will provide a relaxing ambience. You can also pose for photos in front of the glimmering fountain located at the tip of the park. Finally, have your photographer arrange an intimate portrait of you and your fiancée near the waterfront, with the azure Ohio River serving as a backdrop. Once you’ve finished at Point State Park, take a short walk over to Smithfield St. Bridge, less than a mile away. Just one of many “sister bridges” that give Pittsburgh its famous moniker, Smithfield Bridge is the penultimate bridge to cross the Monongahela River before it converges with the Alleghany River near Downtown Pittsburgh. 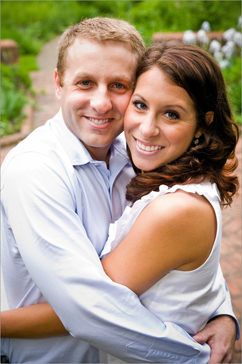 Pose with your fiancée beneath the ornate arches at southwestern end of the bridge for a beautiful portrait. As you walk across the bridge, you engagement photographer can snap photos of you and your loved one with the majestic Monongahela River as a backdrop to the east and west. Finally, take a short car ride through the Mt. Washington neighborhood, which borders the Monongahela River to the south. As you drive through the neighborhood’s steep slopes, you’ll find numerous gorgeous vista points to stop at. Here, your engagement photographer can use the breathtaking panoramic views of the Pittsburgh skyline and the converging rivers to create the most memorable photos for your engagement photo album. One of Pittsburgh’s most prized cultural treasures is the Frick Art & Historical Center, a set of museums and historical buildings located in Pittsburgh’s affluent Point Breeze neighborhood. The Frick covers approximately 5 acres of expanse and contains a plethora of perfect locations for your engagement photo shoot. Begin by exploring the Frick’s finely landscaped lawn and botanical gardens, which will provide a pristine natural setting for your engagement photos. The center’s lawn and gardens eventually culminate at Clayton, the restored home of Henry Clay Frick, himself. Have your engagement photographer organize some portraits of you and your fiancée using the elegant Italianate style of the mansion as a backdrop. The two of you can pose along the balustrade, seated on the front steps, or even beneath the opulent porte-cochere at located at the side of the estate. Also feel free to visit the Frick’s famous greenhouse, whose vibrant and diverse plant life will help create a romantic atmosphere. You can take some seated photos on the benches outside the greenhouse, surrounded by colorful flowerbeds. Finally, visit the Frick Art Museum and have your engagement photographer take photos of you and your fiancée on the front steps or beneath the ornate arched entrance. Don’t miss this opportunity to visit one of Pittsburgh’s most stunning architectural achievements! Contrary to what its nickname suggests, “The Steel City” is not just an urban cityscape with a history of industrial prominence. Pittsburgh also contains numerous scenic recreational parks that have become increasingly popular photography locations. One of the most oft-visited of these parks is Schenley Park, located just south of Carnegie Mellon University. Pittsburgh’s largest civic park covers 456 acres of natural expanse, which includes hiking trails, woods, and fun attractions such as the famous Phipps Conservatory. Along with your engagement photographer, you and your fiancée can spend hours exploring the rugged nature trails or marveling at the gorgeous foliage throughout the park (the trees are particularly colorful during the fall season). You can also relax on Flagstaff Hill, from which you and your loved one can enjoy a romantic view of the entire park, as well as of the Pittsburgh Skyline. Finally, have you engagement photographer create some great portraits with the park’s tranquil Panther Hollow Lake in the background. Just a few miles away, on the other side of the Monongahela River, you’ll find Riverfront Park. Strikingly different from any of Pittsburgh’s inland parks, Riverfront Park provides a charming walkway that hugs the side of the river and is great for a leisurely promenade during the late afternoon hours. Lining the riverwalk are scattered benches, which you and your fiancée can use to relax and enjoy the sight of the water, as well as of Pittsburgh’s countless towering skyscrapers and bridges. Feel free to pause periodically and enjoy the park’s many diverse sculptures, which will add a unique artistic ambience to your engagement photos.